I am currently working up an article on the imagery of the “keys of the kingdom of heaven” in Matthew 16:18. As part of the article I’m discussing the Davidic Christology of Matthew. I’m trying to be as thorough as possible. I’m going to post the first five illustrations here and then follow-up with five more. “The Son of David” (Matt 1:1). Matthew begins his Gospel by connecting Jesus’ role as the Χριστός to his identity as the “son of David” (Matt 1:1). The genealogy that follows in chapter 1 further undercores Jesus’ Davidic lineage. As scholars note, its division into three sets of fourteen generations also seems to underscore its Davidic nature since fourteen is the numeric value of David’s name in Hebrew. Further reinforcing the impression that this sort of gemetria is at work is the fact that David’s name is the fourteenth name on in list. Born in the City of David (cf. Matt 2:4–5). Matthew emphasizes the significance of Jesus’ birth at Bethlehem, the city from which David came (e.g., 1 Sam 16:1; John 7:42). It is the city, Matthew tells us, where the Messiah would be born (cf. Matt 2:4). Bringing Gifts to the Son of David. Matthew reports that magi came from the east and brought gifts of gold, frankincense and myrrh to Jesus (cf. Matt 2:11). According to Psalm 72, “A Psalm of Solomon,” tribute would be brought to the royal Son of David, including gifts of gold (cf. Ps 72:10, 15). Likewise, the historical books describe how figures from the east such as the Queen of Sheba brought gifts to Solomon of gold and spices (cf. 1 Kgs 10:10). The Son of David as an Object of Worship. Intriguingly, after refusing to make the worship the devil the object of “worship” (προσκυνήσεις), Jesus allows others to worship him (cf. Matt 2:11; 8:2; 14:33; 28:9). Given the other Davidic traditions alluded to in Matthew, it is perhaps significant that 1 Chronicles 29:20 identifies the Davidic king as the object of worship with God. The Baptism of the “Son of God” (Matt 3:15–16). The account of Jesus’ baptism in Matthew may evoke Davidic and Solomonic traditions, particularly anointing traditions. When Samuel anointed David king of Israel, the Spirit of the Lord came upon the new leader (1 Sam 16:13). Later we read that Solomon was taken down to a river (Gihon) on the day of his anointing (1 Kgs 1:38–40). Not surprisingly then the Spirit comes down upon Jesus at his baptism, an event which takes place at a river (Jordan) (cf. Matt 3:16). That such Davidic allusions are in play are strongly supported by the reference to the voice from heaven that accompanies the baptism, identifying Jesus as the God’s son. Language of divine sonship was frequently linked with the Davidic king and the eschatological Davidide (e.g., 2 Sam. 7:14; Ps. 2:7; 89:27; 2Q252 V, 3–4; 4Q174 I 1:21:2; 1Q28a 2:11–12 and 4Q369). The only named individual in the genealogy given a title is “David the King” (cf. Matt 1:6). See the discussion in Davies and Allison, Matthew 8–18, 163–5, who conclude: “The name, David, is the key to the pattern of Matthew’s genealogy.” On the gemetria see also John P. Meier, Matthew (New Testament Message 3; Wilmington: Michael Glazier, 1980), 4; Ralph Martin, “Approaches to New Testament Exegesis,” in New Testament Interpretation: Essays on Principles and Methods (ed. I. H. Marshall; Grand Rapids: Eerdmans, 1977), 246. Jesus cites from Deuteronomy 6:13, “You shall worship (προσκυνέω) the Lord (κύριε) your God and him only shall you serve” (Matt 4:10). The MT of 1 Chronicles 29:20 reads וישתחוו ליהוה ולמלך. The LXX renders this with the word προσκυνέω: προσεκύνησαν τῷ κυρίῳ καὶ τῷ βασιλεῖ. The passage clearly caused a problem for the interpreters of the RSV who deliberately obscure the clear reading of the passage (“and worshiped the Lord, and did obeisance to the king”). See also 2 Sam 9:6, 14:4, 22, 23, 33 where individuals are said to fall on their faces and “worship” (LXX: προσκυνέω) David. Likewise, see Collins, The Star and the Scepter, 162: “The individual most often designated as ‘the son of God’ in the Hebrew Bible is undoubtedly the Davidic king, or his eschatological counterpart.” See also Dunn, Jesus Remembered, 710: “It is possible, then, that ‘son of God’ provided another category into which Jesus might have been fitted. This would have been seen as an appropriate corollary to any identification of Jesus as royal Messiah of David.” Furthermore, see Vermes, Jesus the Jew, 194–95: “[T]he title came to be given preferably to the just man, and in a very special sense to the most righteous of all just men, the Messiah son of David” (195). Especially important is the combination in Josephus’ account of Solomon’s exorcistic abilities with his role as healer (cf. A.J. 8.45: “And God granted him knowledge of the art used against demons for the benefit of healing men” [Marcus, LCL]). See also the discussion in Meier, A Marginal Jew, 2:689. In addition, see the exorcistic connections made with Solomon in the Aramaic magical texts discussed by Loren Fisher, “Can This Be the Son of David?,” in Jesus and the Historian: Written in Honor of Ernest Cadman Colwell (ed. F. T. Trotter; Philadelphia: Westminster, 1968), 82–97; J. A. Montgomery, Aramaic Incantation Texts from Nippur (Philadelphia: The University Museum, 1913), 232; Cyrus H. Gordon, “Aramaic Magical Bowls in the Istanbul and Baghdad Museums,” ArOr 6 (1934): 319–34, 466–74; C. D. Isbell, Corpus of the Aramaic Incantation Bowls (SBLDS 17; Missoula, Mont. : Scholars Press, 1975), 108-111, 114-115. Sanders writes, “The fact is that the number twelve itself, apart from the details of any individual saying, points to ‘all Israel’” (Jesus and Judaism, 104). See, e.g., Isa 9:1–9; 11:1, 11–13; Jer 23:5–6; 30:1–11; Ezek 34:23–31; 37:15–19; Pss. of Sol. 17:31. As Laato points out, the two most celebrated Davidic kings after Solomon, Hezekiah and Josiah, both exhibited the concern for the northern tribes (2 Chr 30:10; 34:6, 33). See Antti Laato, A Star is Rising: The Historical Development of the Old Testament Royal Ideology and the Rise of the Jewish Messianic Expectations (Atlanta: Scholars Press, 1997), 233. It seems clear that the imagery in Zechariah 9:9 was linked with Davidic traditions. Not only does the passage use language reminiscent of Solomon’s entrance into Jerusalem (1 Kgs 1:33, 38), the vision also includes language in verse 10 (ומשלו מים עד־ים ומנהר עד־אפסי־ארץ) which also appears in Psalm 72, a psalm whose superscription links it to Solomon (וירד מים עד־ים ומנהר עד־אפסי־ארץ). In addition, the territory mentioned in Zechariah 9:1–8 includes the boundaries of David’s empire. See P. D. Hanson, “Zechariah 9 and the Recapitulation of an Ancient Ritual Patter,” JBL 92 (1973): 48–50 [37–59]; idem., The Dawn of Apocalyptic (Philadelphia: Fortress Press, 1989), 317–20; Wilhelm Rudolph, Haggai, Sacharja 1–8, Sacharja 9–14 (KAT 13/4; Güttersloh: Mohn, 1976), 170. It should also be pointed out that the crowds’ action of spreading garments on the ground before him (Matt 21:8), mirrors the way the people greet the newly crowned king of Israel in 2 Kings 9:13. See, e.g., Brent Kinman, “Jesus’ Royal Entry into Jerusalem,” in Key Events in the Life of the Historical Jesus (Tübingen: Mohr-Siebeck, 2010), 405 n. 58; R. T. France, The Gospel of Matthew (NICNT; Grand Rapids: Eerdmans, 2007), 779; William Craig Lane, The Gospel of Mark (NICNT; Grand Rapids: Eerdmans, 2002), 433. Against this backdrop it is interesting that the crowds also seem to evoke Tabernacles imagery by citing Psalm 118 and using branches (cf. Matt 21:8; John 12:13), a feast which also seems to have been linked with the enthronement of the king. See Brunson, Psalm 118 in the Gospel of John, 42–45. The use of such imagery does not necessarily imply that the entrance took place on Tabernacles as T.W. 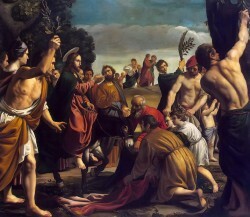 Manson suggested (“The Cleansing of the Temple,” BJRL 33 [1950–1951]: 271–82), but may imply an improvised celebration (e.g., France, Gospel of Matthew, 779), which was meant to evoke such traditions. See, e.g., Fredriksen, Jesus of Nazereth, 247. Numerous examples of passages highlighting Jesus’ Davidic identity could be pointed out. Especially interesting is the appearance of this motif at Jesus’ baptism in the river Jordan, which itself appears reminiscent of Davidic traditions, particularly royal “anointing” traditions. A heavenly voice declares that Jesus is the son of God, evoking Psalm 2, which has been identified with enthronement ceremonies (cf. John Eaton, Kingship and the Psalms [Naperville, Ill.: SCM Press, 1975], 111–113; Craig C. Broyles, Psalms [Peabody, Mass. : Hendrickson Publishers, 1999], 44; etc.). The descent of the Spirit upon Jesus also evokes the anointing of David, while the river location appears reminiscent of Solomon’s anointing at the river Gihon. Indeed, in Luke 4:17–18 Jesus appears to link his baptismal experience with the anointing of Isaiah’s servant. For further discussion see Bock, Luke, 1:341–443; Green, Luke, 186. Moreover, Luke seems to bring the Davidic parallels to the forefront. Since the Davidic king was typically anointed by a Levite (cf. 1 Kgs 1:39), it is further likely that it is no coincidence that Luke describes Jesus’ baptizer as a Levite himself, the son of a Levitical priest (cf. Luke 1:5). Interestingly, immediately following his baptism, Luke tells us that Jesus was thirty years old when he began his ministry (Luke 3:23), the same age David was when he began to reign as king (2 Sam 5:4). After this, Luke demonstrates Jesus’ Davidic pedigree, tracing his lineage back through David (Luke 3:23–38). For Luke, who describes the ascension in terms of Jesus’ royal enthronement, the parallel with David continues. Mark Strauss (Davidic Messiah in Luke-Acts, 145) explains, “An analogy may be drawn here to David, who was chosen by God and anointed by Samuel long before he was enthroned as king.” For fuller discussion on these and other Davidic parallels see Wright, New Testament and the People of God, 379–381; Strauss, The Davidic Messiah in Luke-Acts, especially 207–8; Miura, David in Luke-Acts, especially, 197–98, 211–215; Hahn, “Kingdom and Church in Luke-Acts: From Davidic Christology to Kingdom Ecclesiology,” in Reading Luke: Interpretation, Reflection, Formation (C. G. Bartholomew, J. Green and A. Thiselton, eds. ; Carlisle: Paternoster Press, 2005), 294–326; idem., “Christ, Kingdom and Creation: Davidic Christology and Ecclesiology in Luke-Acts,” Letter & Spirit 3 (2007): 113–138.